According to Oxford Dictionary, red carpet is ‘A long, narrow red carpet laid on the ground for a distinguished visitor to walk along when arriving.’ This dictionary also proposes one idiom related to the red carpet – red carpet treatment. This idiom is used ‘in reference to privileged treatment of a distinguished visitor.’ Viktor&Rolf’s Autumn/Winter 2014 collection meet that definition au pied de la lettre. This Amsterdam based duo literally made the dresses from the red carpet. Viktor&Rolf took part in The Future of Fashion is Now exhibition at Museum Boijmans Van Beuningen in Rotterdam with two of their collections; Autumn/Winter 2013 aka Zen Garden collection [x] and Autumn/Winter 2014 aka collection executed entirely in red carpet. Although the Zen Garden one was broadly exhibited, the second collection made a bigger impression on me. Two white figurines with two dresses and two pair of shoes, all made from red carpet – that was it, quite decent display but perfectly contrasting to all glamorous world of red carpet. There was something magical about the material. Or maybe is it just something in human nature that we are subconsciously attracted by red carpet? The designers found in a carpet manufacturer Desso a great partner for this collection. This Dutch company produced carpet without the usual rubber backing and also carpet with animal skin motifs, according to their words ‘shaved and laboriously hand-appliquéd carpet, which takes up to 300 hours per look to complete.’ The clothes were wrapped around body and a little bit resembled bath towels from afar. Dresses were accompanied by jewels and shoes made in the same style. Collection was initially presented in Paris, obviously on the red carpet, followed by a rhythmic clapping song [Video]. This presentation is worth watching. Viktor&Rolf themselves describe this collection as ‘a meditation on a current obsession.’ Are we actually a society obsessed by a red carpet? Are we a red carpet culture? People are no more afraid of walking on the red carpet. First of all, there were popes and heads of states. Red carpet marked the route they were taking on ceremonials and special occasions. Red carpet is now mainly associated and broadly used by celebrities and all VIPs glamour world. 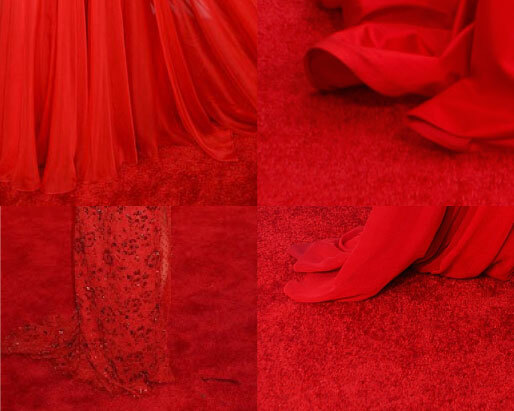 For those who are interested, exhausting and detailed history of red carpet is here. Bearing in mind Agamemnon’s story and the fact that red carpet is only for gods, I realised that maybe the basis is still the same but we changed our faith. 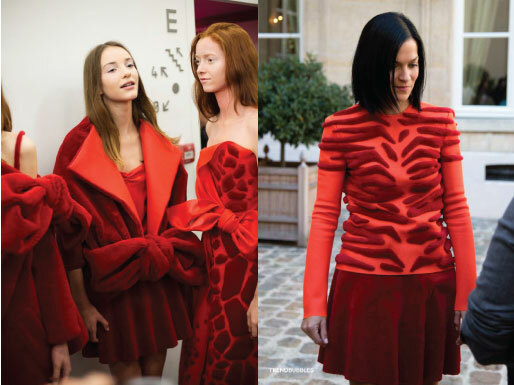 We can also consider the red carpet as the first marketing tool in the history of fashion. In the early decades of the 20th century there were the celebrities (actors and actresses, singers, dancers as well as members of noble families) who carried fashion impulses. Nowadays designers like to dress celebrities for red carpet events because their photos literally see the whole world. In this context we can understand Viktor&Rolf’s collection as a revolt against this trend. Nowadays, the actual event may seem overshadowed by the red carpet. Just look at this video of Oscar preparation – workers rolling out the red carpet and a huge amount of photographers and media in place to depict that very moment. It might be as well really stressful moment for celebrities in terms of perfectionism. All the world is watching every detail, manicure, hair, make-up, dresses, jewellery, manner of walking, everything. In the event of Emmy’s 2014, E magazine also prepared so called ‘clutch cam’ and ‘mani cam’ so the viewer could see every detail even closer. Walking the red carpet can actually be a nightmare. Celebrities might not eat for days or even weeks before the event. You can look at how many results you find when searching on google for ‘how to be red carpet ready’: tips on diets, workouts, pills and many many more. We developed some kind of camouflage pattern for being invisible in the nature. Can we also be invisible on the red carpet? Viktor&Rolf dresses can represent one way of reaching invisibility but I searched for more examples where celebrities tried to disappear. I think that Viktor&Rolf caught really well this current obsession. Suzy Menkes, Vogue fashion journalist, expressed it in a good way: ‘two brilliant minds catching a sociological thread.’ [x] I can only agree with her words. Red carpet represents a new value of our lives. If we think about the idiom ‘red carpet treatment’ I have one suggestion for future. Maybe we will have real red carpet treatments. Covering our body with red carpet for certain amount of time will cure illness and give back lost self-confidence.